Warwick & Warwick is one of the leading UK auctioneers and valuers of collectables with an unrivalled team of departmental experts. Our aim is to help you achieve the maximum possible realisation for your material, but we also take great pleasure in knowing that specialist collections will be preserved for future generations. We are constantly seeking high-quality items for auctions, and conduct regular advisory days to maintain our position as the leading UK auctioneers of collectables. We are also pleased to provide valuations for insurance, probate and other purposes. 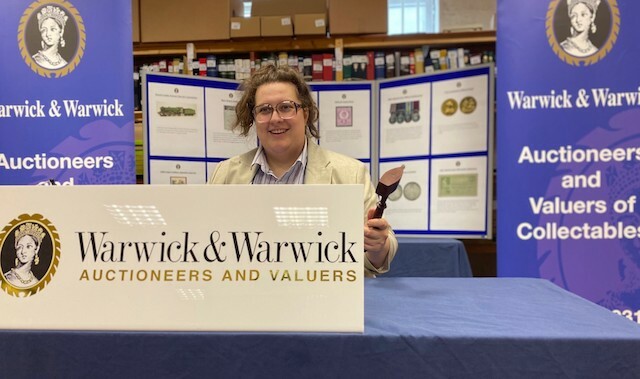 Many of the experts in our team can boast more than 25 years of continuous service at Warwick & Warwick, meaning we are well placed to assess the best method of sale for your collectables. In our experience, original collections are often best sold intact to preserve their unique appeal. If we think a better price will be obtained by offering your property as a number of lots however, we will use our expertise to lot your material to its best advantage. Whether you are a collector of modest means or have a collection of award-winning calibre, you will receive the same meticulous care and attention from our experts and be able to depend upon their advice. If you have some collectables or a collection to sell, we will be pleased to advise you and arrange for a fair, accurate and free valuation by one of our experts. Conducting an appraisal of the collection is the first step, most valuations are carried out by a relevant expert at our Warwick premises, where we have access to a library of technical books, catalogues and a database of information concerning recent realisations. We are pleased to receive material for valuation at our regional advisory days. Our venues are listed on our Advisory Days page and in the local press. Alternatively, you can visit us at Chalon House in Warwick or lodge your property at our administration office in Chester to be transferred to our valuation department. For larger collections, we are happy to make home visits or arrange for free insured delivery to our offices. Once our experts have valued your collection, we will write to you advising you of the valuation and recommending the most relevant method of sale, whether that is at auction or a private treaty sale. There are two ways to sell at Warwick & Warwick – either through the traditional auction method or via a private treaty sale. Auction sales: Each department organise regular sales throughout the year and publish a well-illustrated catalogue for each auction. All sales are also listed online ensuring maximum exposure to potential bidders for your material. Private treaty sales: This service represents a unique opportunity to obtain a quick and efficient sale at current market levels. Our experts will determine a fair and current commercial value for you and sale of your items will be concluded in a matter of days. To discuss the most suitable option with one of our experts, email email us, call 01926 499031 or visit our Marketing Your Collection page now! UK auctioneers Warwick & Warwick advertise extensively in specialised publications and on relevant websites to offer your material to the greatest numbers of potential buyers. Our own website receives thousands of visitors per month and is generally very prominent on internet searches. We also have excellent links with local, regional and national media outlets to ensure that items which are of special interest attract maximum publicity. Our extensive register of collectors and their specialist interests is also invaluable, allowing us to bring your items to the attention of the largest possible audience of interested buyers. All auction dates are published in advance, and auction catalogues are usually produced approximately one month before each sale. Each auction contains a wide range of material, with something of interest to collectors of every sort. Great care is taken to ensure that descriptions are precise and accurate, whilst illustrations of more important items are included. Catalogues are available on subscription and a printed copy will be forwarded to you upon request. Catalogues are also available to view online and scans of the most important sections of lots are available. Sales may also be viewed at our offices in Warwick during the days preceding the sale. To bid in an auction, either attend the sale in person or send your bids by email, fax, phone, post or by using the website bidding facility. Click here now to learn about buying at auction - including bidding increments and other useful information. Securing the future of a valuable collection is often very important to collectors, who may wish to register with Warwick & Warwick’s unique Trustee service. We will be pleased to advise collectors, solicitors, executors or any other professional advisers who may be involved in the disposal of an estate. Complete confidentiality is, of course, observed at all times. For more information, take a look at the benefits offered by our Trustee Department today. If you are the secretary of a society that’s looking for a speaker for a meeting, Warwick and Warwick’s experts will be happy to help you. Retired director, Colin Such, who joined the company in 1975 and is now a consultant to the postcard department, provides a presentation entitled ‘Forty years on the Rostrum’ which documents many of the fascinating and unusual items which have come under the hammer. Postcards, Colin’s favourite topic feature prominently but stamps, medals, autographed letters and cigarette cards are also mentioned. Colin gives presentations to local groups, by arrangement. Colin also has a presentation entitled ‘Travels of an Auctioneer’ based largely on old letters and postal history. Joe Cottriall, a senior philatelic valuer with over 20 years’ experience, offers a presentation entitled ‘The View from the Rostrum’ which is largely concerned with stamps, but does include other collectables. Call 01926 499031 for further details.